Some may joke that when Matt Bradley bleeds, the Caps find a way to win. A role player that doesn't mind dropping the mitts. Bradley was a choice by McPhee had to make at the end of the '07-'08 season when the Caps lost to the Flyers in seven games. It was either the young Bradley or the agitator Matt Cooke. McPhee stuck with Bradley and hind sight being 20/20, it was a good call. Bradley doesn't add much offensively. In 61 games played, he only tallied four goals and seven assists. He did rack up the penalty minutes with 10 fighting majors under his belt. Bradley showed some offensive deft when he racked up 6 points in the playoffs in '08-'09 season. It helped the Capitals to do away with the New York Rangers and kept the series with the Pittsburgh Penguins close. 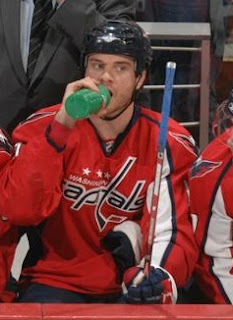 The Caps benefit from Bradley's tough play. He can boost moral with a drop of the gloves and has the straight forward speed to make him somewhat of an offensive threat. This year he has sort of disappeared in the new defensive system. But he still had solid year for what the Caps use him for. Bradley adds a lot to the locker room and to the environment. He actions are usually moral boosters for the bench. Whether it is a big hit or an offensive chance from the checking line, he is a fan favorite in Rock the Red nation. He firmly understands his role as a protector for the higher paid players. He has the hockey smarts to understand what he needs to know to stay at the NHL level. There might be a bump in salary. At the moment Bradley makes $1 million a season. A bump in pay would take him into a level that would pressure him to produce more offensively. The Caps already have a drop his gloves guy in Matt Hendricks and having the pair could just be taking up space both on the bench and the roster. Bradley has not produced a point this post season and was a -3.